A compelling mission, vision and core beliefs provide a strong foundation for a strategic improvement plan. They beg the next big question: what specifically do we want to achieve? 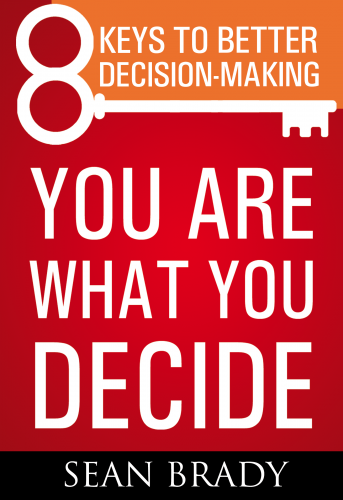 Now, the conversation is all about target setting, resource allocation and focus. To complete the strategic plan, Prism facilitates your team to set performance targets, agree to long-term strategies and identify immediate priorities over two more intense and inspiring days. The planning team begins by reviewing three- to five-year performance trends on all key academic indicators. They then set performance targets in a two-step process. 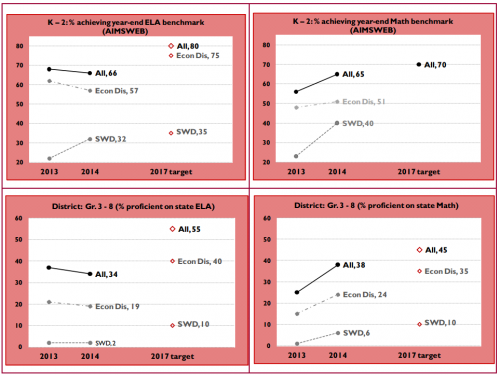 First, they select a set of measures to assess performance of the entire K to 12 system. Then, for each measure, they set three- or five-year targets. 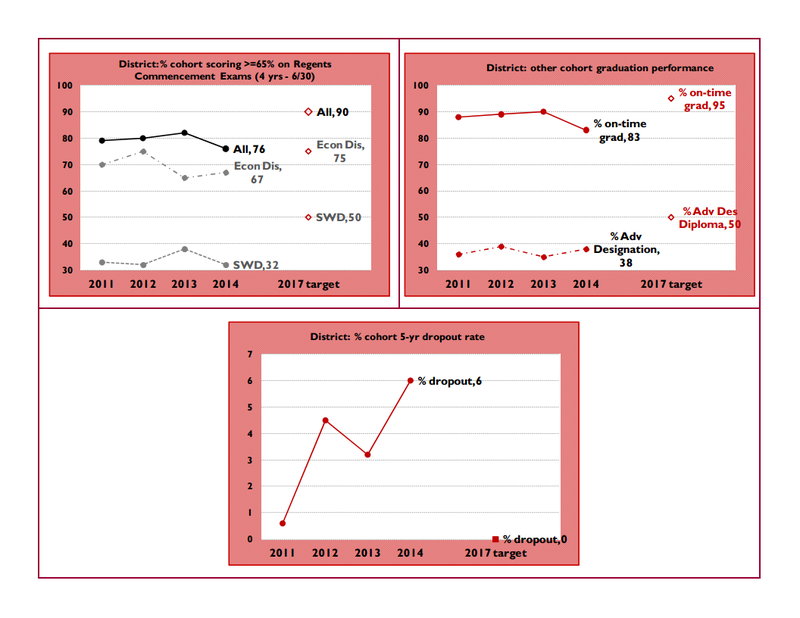 With the targets set, the district team quickly identifies the key performance gaps they need to close. Now that the team knows what explicitly it wants to achieve — including the largest performance gaps to close — it needs to identify long-term strategies and immediate priorities. A strategy simply answers the question: what do we need to do to achieve our mission, vision, core beliefs and targets? 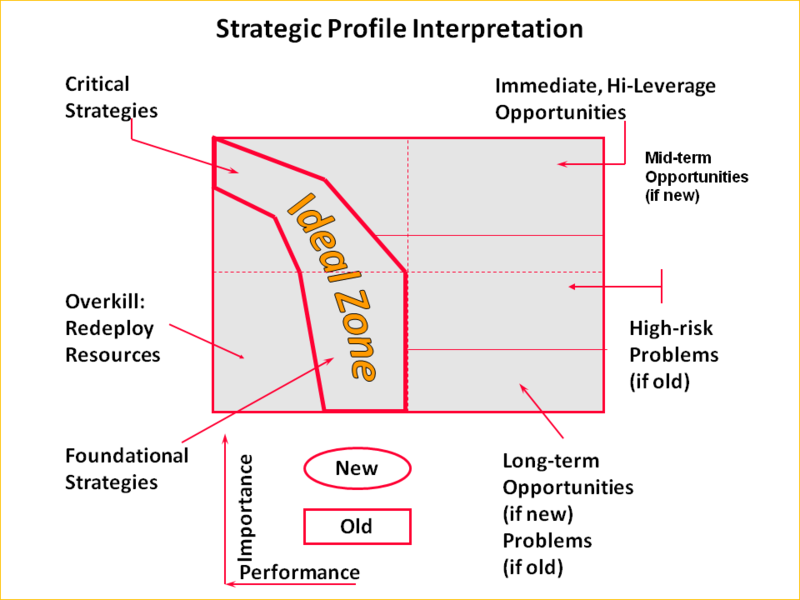 Strategies are generated by a wildly divergent process that includes a collaborative strength, weakness, opportunity and threat analysis (SWOT) and typically produces 100 – 150 draft strategy statements. The group converges on a final set of strategies in an efficient, structured process. They then identify the immediate priorities that will garner a disproportionate share of resources, focus and attention over the next 12 – 15 months. 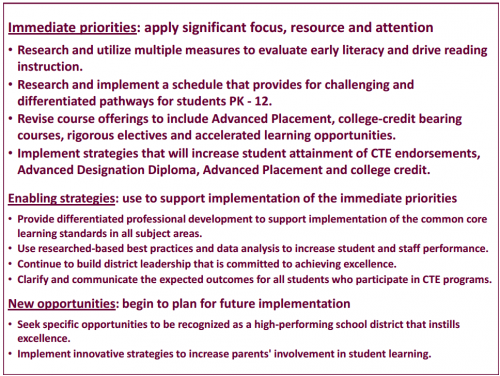 These priorities focus on increasing rigor specifically by ensuring CTE students receive technical endorsements and others graduate with Advanced Placement or college credits. 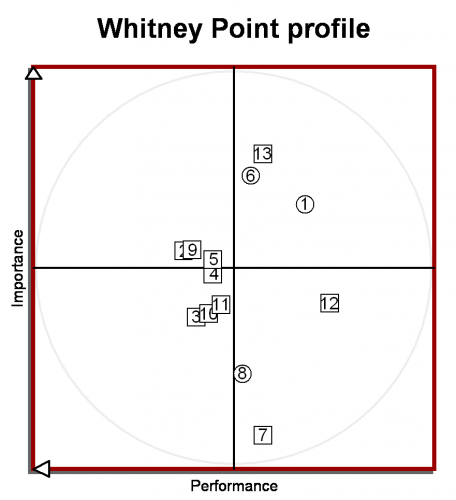 For example, see Whitney Point’s strategic profile. This two-dimensional scatter diagram displays how the district team assessed 13 strategies. 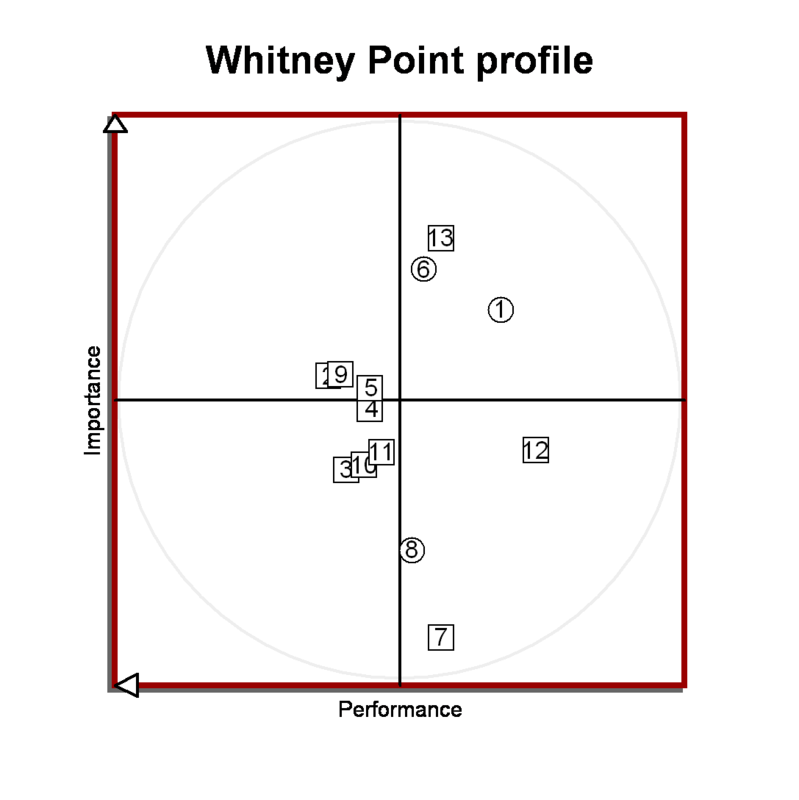 The vertical axis indicates their relative importance; the horizontal axis indicates their current performance; old strategies are displayed in squares and new strategies, in circles. 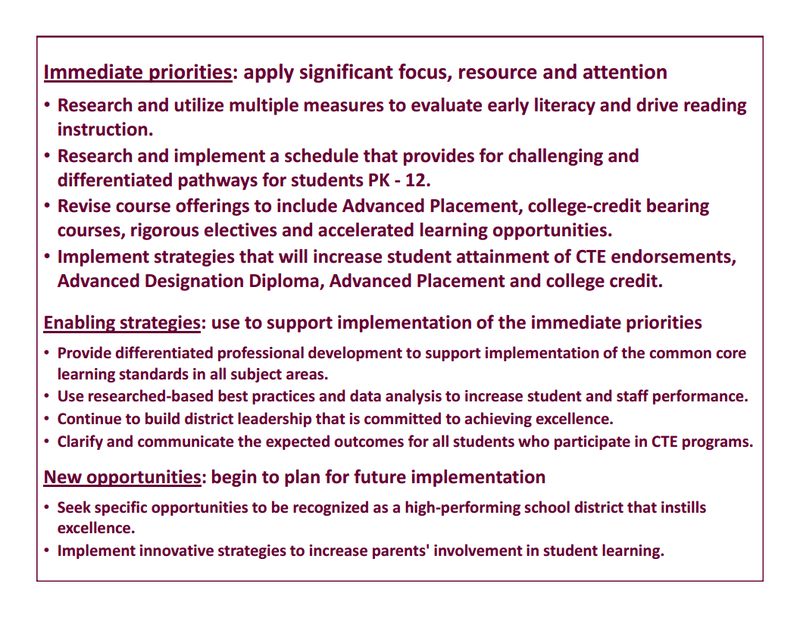 The profile interpretation guide helps the team to identify district priorities. Strategies #13, #6 and #1 dominate the remaining 10 strategies in importance and they are also underperforming. These very important, under-performing strategies are priorities: immediate, high-leverage opportunities that are ripe for resources and attention. As a final check, the district team uses Prism’s Group Decision Support System to facilitate the consensus process and ensure final, explicit support for the academic improvement plan. With the district plan as context, school teams produce their own building improvement plans with performance targets, key activities, and detailed action plans including specifically who will do what by when with what resources.